High quality professional instrument. 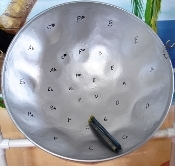 Steel Drum has an 23-inch playing surface with 28 to 29 notes (High Tenors and Low Tenors). Make an excellent instrument/gift for a beginning student or experience professional musician. Stand is made from unfinished PVC tubing. 2 wooden sticks with latex tips.